We were asked to re-design and build this garden in Highgate. The house looked out onto a 12 foot rear boundary which was far too imposing for the space. 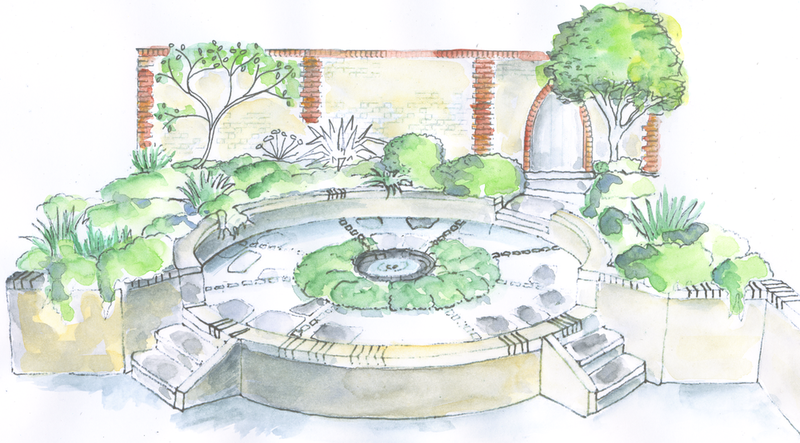 The brief was to create a traditional walled garden in the style of the Arts and Crafts movement. The challenge was to utilize the space in whole garden and keep the focus within the garden rather than on the high rear wall. This was successfully achieved by building a false 5 ft door in the rear wall. This strong focal point also made the garden appear larger. The rear and left hand boundaries were built from a pattern of Soft Reds and Pale Gault reclaimed bricks that matched the existing brickwork of the house. The left wall gently curves upwards to meet the rear wall. 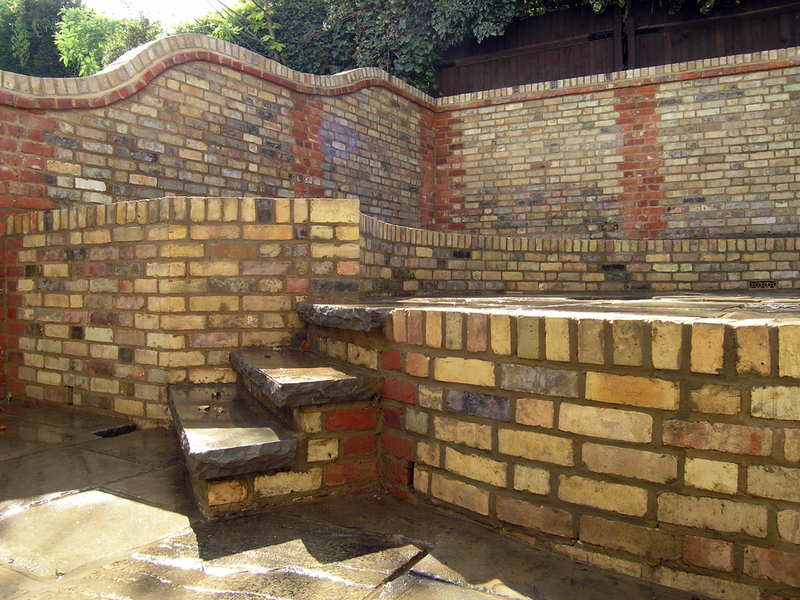 The upper level of the garden is made up of Yorkstone inset with Rustic Gault bricks. 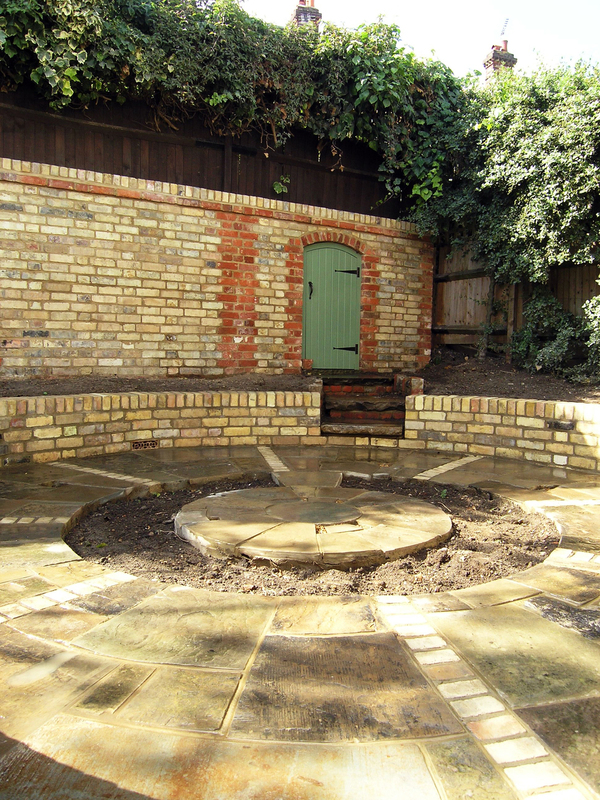 Each piece of Yorkstone was carefully selected and cut to produce a beautiful radial pattern. Surrounding the patio is a circular wall retaining the planting area. Two pairs of radially cut yorkstone steps lead to the circular patio, opening up the right boundary which was previously an unusable corner. The end result is an elegant timeless garden that looks as though it was constructed at the same time as the house - will last the lifetime of the house and look more beautiful with age.